The fund with an allocation of RM 1 billion is meant to assist lower income homebuyers finance the purchase of their first homes. The scheme is available for a period of two years starting from Jan 2, 2019, or until the RM1 billion fund is fully utilised. 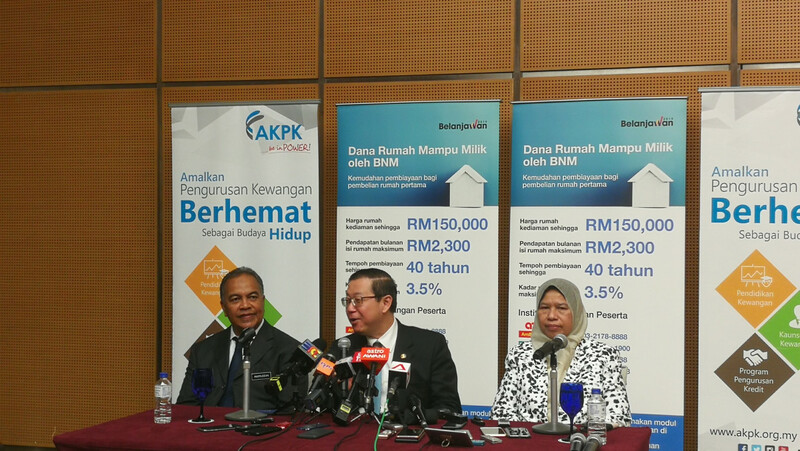 At the launch of Fund for Affordable Homes today, Finance Minister Lim Guan Eng said the scheme will help many people who are facing difficulty in getting a housing loan owing to financial illiteracy and the lending guidelines. "We need to come up with creative ideas continuously such as peer-to-peer lending to solve this last mile problem of [homebuyers] not being able to get financing and we are trying to reach that. I also urge all parties including the private sector to continually commit to build affordable homes through a comprehensive and continuous plan," said Lim. Also present at the launch were Housing and Local Government minister Zuraida Kamaruddin, Bank Negara Malaysia governor Nor Shamsiah Yunus and Agensi Kaunseling and Pengurusan Kredit (AKPK) president Anuar Mohd Hassan. To be eligible for the scheme, one must be a Malaysian citizen from a household earning a maximum income of RM2,300; a first-time homebuyer; a salaried worker or self-employed; no record of impaired financing for the past 12 months; and financing under the fund can be given to single or joint borrowers (also must be Malaysian citizens). The fund is available at five participating financial institutions: AmBank, Bank Simpanan Nasional, CIMB Bank, Maybank and RHB Bank. The maximum financing rate is 3.5% per annum with a maximum of 40 years or up to 70 years of the applicant's age, whichever is shorter. Other special incentives provided in the scheme include the waiver of processing fee for financial application, down payment support (to be included as part of the financing, subject to the participating financial institutions' assessment), affordable rates for mortgage protection cover (MRTA/MRTT) and stamp duty exemption by the Inland Revenue Board. Only primary market residential properties (landed/flats/apartments) priced at RM150,000 and below are eligible under this fund. Borrowers with the Fund for Affordable Homes are not allowed to sell the homes within the first five years from the date of the last disbursement or a penalty of 2% on the outstanding finance will be imposed by the financial institutions. Users of the scheme must also go through a free and easy-self assessment online financial education course conducted by AKPK called RumahKu. The latter is also an online portal that can assist potential homebuyers to assess their ability to meet the financial commitments associated with owning a home. The participating financial institutions will require applicants to provide the certificate number of the completed online learning course to process the financing application. Since the kickstart of the fund on Jan 2, a total of 16 applications have been submitted and five have been successfully processed. Lim also announced that his ministry is working with Real Estate & Housing Developers' Association Malaysia on a homeownership campaign for second-time and above property buyers for properties priced up to RM2.5 million. The scheme is expected to be announced in the next six months.